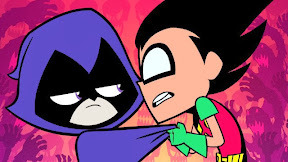 Despite its creative origins which stemmed from the original Teen Titans series that ran for five seasons as well as the D.C. Comics and animated shorts that helped build momentum for its return, Cartoon Network’s newest incarnation of Titans is a quirky hybrid that’s part animated sitcom and part superhero character-driven series. 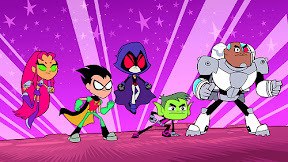 Yet taking place in Jump City mostly when the teenage team of crime fighting titans – led by Batman’s own superpower challenged Boy Wonder sidekick Robin – are off the clock, Teen Titans finds the five characters all dealing with the unglamorous day-to-day battles of chores and roommate drama without the aid of an adult caped crusader telling them what to do. With this all-kids-all-the-time aura, Teen Titans Go! does suffer from the unfortunate current trend of youth-oriented animation that believes that louder is better. As such, it serves up lots of unnecessary shrieks and exclamatory bursts of dialogue to punctuate the similarly hyperactive-friendly, ever-changing plotline that breaks up each eleven minute show into an A, B and sometimes even C or D storyline as well. Nonetheless, Teen is at its best when it respects the intelligence of its viewers. 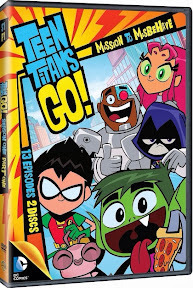 And in this newly released slim-packaged two-disc DVD set that serves up the first half of the first season (or 26 eleven minute episodes), there are some dynamic examples of what this show can achieve when it does just that but unfortunately you have to endure a lot of filler to find the diamonds in the rough. While obviously those picking up on the theme that Robin is the MVP character wouldn’t be wrong but fortunately the other voice actors get their chance to shine in other collection hits including the Telenovela themed “La Larva de Amor,” “Hey Pizza!” “Staff Meeting,” “Matched” and a truly ingenious “Colors of Raven” episode that brings out the Multiplicity-like many character traits of the usually one-note, sardonic Raven. 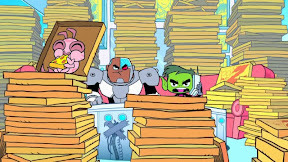 While most adults will find all the shouting as well as the lack of any real character development less than satisfying, thanks to the ultra-bright animation style that has a Pokemon like feel and fast moving tales, Teen Titans Go! is sure to find an audience in children who are a bit too young for some of D.C. Comics and Warner Brothers’ more mature superhero fare.